I like mystery cam. Send it. I'll pay to ship it back. Happy 4th of July! Added Volvo B grind and the mystery cam as provided by TurboDenny. Thanks very much for that! Given that the cam has no markings except a blue stripe and is slotted, we're of the opinion that this is an IPD Turbo cam, which I actually kinda like as an N/A cam, given the specs. If anyone has input on it, please feel free. As I said, it's just our best guess. At this point we're out of cams, except for a T that's in a car right now. If anybody wants to throw a couple at me for the next time I have time (these two took about 5 hours start to finish), that would be great. Don't send me something you're going to need back right away, I just can't get to it that quickly. Well that's some good news I suppose. That cam was out to the trash until you decided to measure it. Glad I sent it your way! enem C2 sitting on the bench, it's broken (rear thrust collar), but not sure if that matters for just measurements. Nope. As long as it has #1 and #2 cam journals on it, we can use it. Please make sure to include a return address. I'll pay to send it back. 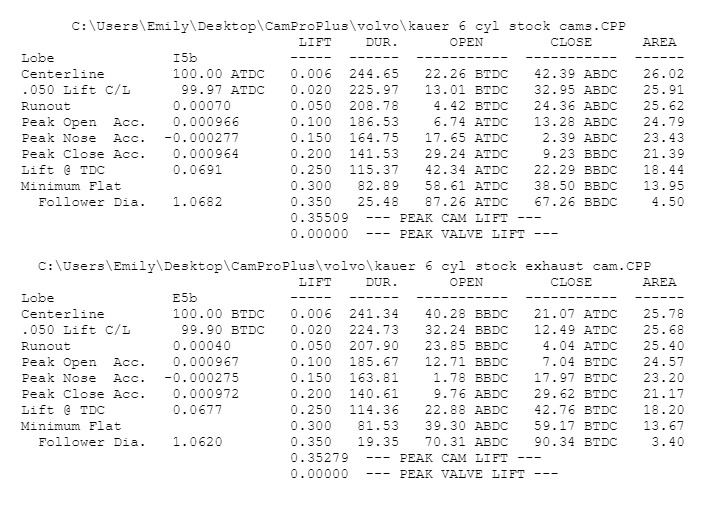 If you look at these cam profiles, the factory cams all have a ramp speed of 0.050" per 10°, pretty much across the board. I'd like to see what one of these true aftermarket performance cams looks like. I had a KG7 but never measured it, but I can tell you the duration over 0.300" was WAY longer than anything else we'd seen. 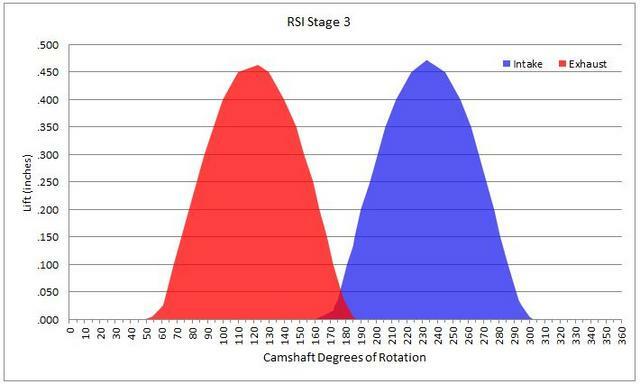 Can I get you to do an RSI Stage 3 cam for me in a somewhat expedited fashion? Be willing to pay a few bucks as it's now a service I need. I'd like to note to any potential camshaft senders that this is no longer the correct address. Again, if you want to just send them to me, I'll know what to do with them, and I'll pay to send them back. Please hold until Spring though. Brr. How are you guys jigging things up? We set up the dial indicator but in order to reach the bucket and clear everything it is at a slight angle. That's going to slightly skew total values. For me it doesn't matter as much because I mostly just need the profile and to use the data to calculate valve acceleration so it's good data. I'll clean up my scratch pad and submit it for posterity. if any huge brain wants to help me make sense of this hit me up It'd help if it wasn't translated from Turkish! That exhaust closing ramp looks pretty aggressive. I've measured 2 dozen B20 cams, so I know how much time and effort this takes. Stupid question number one: What is the HOT running clearence of these things? Also, next time, take .001" measurements atleast for 10° each side of official lash, this will tell you how far you can stretch or shrink for a crude duration test, to give you a direction on which lobe duration next time you pick one. Hot valve lash is .35-.45 mm, or 16-19 thou versus the cold .30-.40 mm. I'm not really sure what you mean by the second part. You mean the difference in duration between tightest possible lash and loosest? I know shoestring and I discussed that at one point and measured it on at least one cam with the difference being pretty trivial (K cam if I recall correctly, with the number being about four degrees which sounds significant until you think of the valve open area). Then again I may be misremembering. Looking forward to it warming up here in MA so we can do more measurement. Good to hear more people are out there measuring stuff! Great work! IN for 16v cam differences. Penta, vs car. And other offered upgrades would be of epic porportions Sirs. Have you thought of using a softer, but longer, spring under the bucket without a retainer and valve? This would eliminate the duration errors due to the lash. Measuring the cams with lash is lowering the total duration figures and making the opening/closing ramps look more aggressive. While this is very comparative, it's lacking in accuracy if someone was to compare lift and duration values for a cam that was not measured this exact way. I didn't, mostly because we measure these out on my daily. I hear what you're saying. If manufacturers advertised what lift value they use, I would have used it. As it is, when I look at other charts displaying similar info (such as the cam chart that's listed on this website under "resources", none of my numbers line up. It looks to me like those may have been measured on "lash plus 0.5mm". It's just a guess, albeit an educated one. Like anything, you don't know what you don't know. Measuring with the lash provides an accurate representation of what you're getting, installed and running. It may vary slightly if you fudge your lash figure, but I don't think it's going to affect how the engine performs. They're just not that refined. It's why we tried to provide as many duration@lift points as we could think of. Even domestic manufacturers aren't totally comparative. Crane, for example, says seat-to-seat timing is measured at 0.006", Comp says it's at 0.004". Corporate secrets, I guess. agap.se is very good at showing duration@lift figures. Aside from them, the rest is guesswork. It may vary slightly if you fudge your lash figure, but I don't think it's going to affect how the engine performs. They're just not that refined. Lash definitely has an effect on how the car runs. Make them too tight and it’ll idle poorly as well as have worse emissions and drivability below 2000rpm or so. At least with a larger than M or T cam, anyway.